The men's World Championship takes place in Slovakia from 10-26 May, with Great Britain competing in the top division for the first time since 1994. 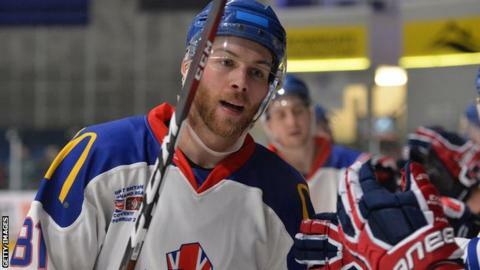 Great Britain, who have never won the tournament, were promoted to the top flight after winning their group to seal promotion in Hungary at last year's Division One World Championship. GB will compete in Group A alongside 26-time champions Canada, Denmark, Finland, France, Germany, Slovakia and the USA, with their matches taking place in the Steel Arena, Kosice. Peter Russell's side will face host nation Slovakia as well as Italy, Hungary and KHL side Torpedo Nizhny Novgorod in a series of warm-up matches before beginning their World Championship campaign against Germany on 11 May. Provisional 28-man squad - will be reduced to 25 prior to World Championship. Netminders: Ben Bowns, Thomas Murdy (both Cardiff), Jackson Whistle (Sheffield). Defencemen: Josh Batch, Evan Mosey, Mark Richardson, Sam Duggan (all Cardiff), Tim Billingsley, Steve Lee, Josh Tetlow (Nottingham), Dallas Ehrhardt (Manchester), Ben O'Connor, David Phillips (Sheffield), Paul Swindlehurst (Belfast). Forwards: Ollie Betteridge, Robert Farmer, Robert Lachowicz, Brett Perlini (all Nottingham), Ben Davies (Guildford), Robert Dowd, Jonathan Phillips (Sheffield), Luke Ferrara, Ben Lake (Coventry), Mike Hammond, Ciaran Long (Manchester), Liam Kirk (Peterborough), Matthew Myers (Cardiff), Craig Peacock (Glasgow), Colin Shields (Belfast), Joey Lewis (Kaufbeuren, GER). All times are BST. Schedules are subject to late changes. The BBC is not responsible for any changes that may be made.